The genus Graptemys (Map turtles and Sawbacks) contains 14 species, the most species of any North American turtle genus. Eight of these species are endemic to single river drainages of the southeastern United States. Even though the genus has a large number of species, we still know little about their basic life history and ecology. Their taxonomy has been equally challenging, with six Graptemys species described between 1950 and 2000. The last formally described species, G. pearlensis (Pearl River Map turtle, in 2010), further underscores the little we know about the genus. It is possible that additional "cryptic species" may occur and be described in the future. Currently, I am focused on population surveys of Graptemys oculifera (Ringed Sawback) and Graptemys pearlensis (Pearl Map Turtle) an urban stretch of the Pearl River in Jackson, MS. This stretch has been highly modified over the last 50 years including channelization, desnagging, and repression of riparian vegetation. All of these are extensive alterations to riverine habitat, and therefore, may influence population densities. Further, even though Jackson is the most populous city along the Pearl River, relatively little is known about both species in this stretch. 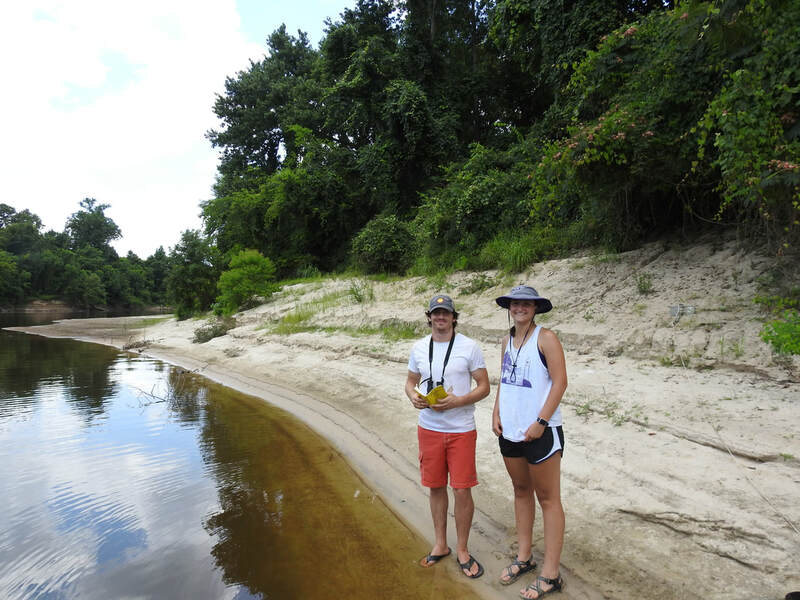 Millsaps students and I surveyed for both species during the summer 2017 and 2018 in this stretch of river. We have found a sizable population of G. oculifera including adults and juveniles, indicative of a population with above average recruitment (contrary to our predictions). Graptemys pearlensis also occur in this stretch, but they are in much lower densities. We plan to complete fieldwork for this project following the Summer 2018. I am working to determine the extent of genetic diversity in both G. pearlensis and G. gibbonsi as part of a collaborative effort with Bob Jones (MS Museum of Natural Science), Peter Lindemen (Edinboro University), and the University of Southern Mississippi. Numerous tissue samples for both species have been collected over the last 10-15 years, but there are significant gaps in the sampling. During the summer 2018, I sampled for both species in the Pearl and Pascagoula drainages to fill in these sampling gaps to help us better determine population genetic variability in both species. University of Southern Mississippi graduate student, Luke Pearson, will be using population genetic tools to assess genetic variability and the potential population structure for both species. ​The Graptemys genus has 8 documented species in MS. However, based on existing distributional data, it seems very likely that an additional species, Graptemys geographica (Common Map Turtle), may occur in tributaries of the Tennessee River drainage in northeastern MS. The southeastern most distribution for the species is the Tennessee and Cahaba River systems of Alabama. Interestingly, a small portion of the Tennessee drainage occurs in Tishomingo County in northeastern Mississippi. During the summer 2017, USM graduate students and I surveyed Bear and Cedar creeks in Tishomingo County and documented G. geographica in both streams. This included the first specimens for G. geographica that were deposited in the MS Museum of Natural Science. Surveys will continue during the Summer 2018.